Selat Panjang - The Directorate General of New Energy, Renewable and Energy Conservation (DG EBTKE) has completed the installation of Energy-Saving Solar Lamps (LTSHE) of 211 units in the Meranti Islands Regency in an effort to provide access to modern energy for the people in the border region. Symbolically, the Downstream Oil and Gas Regulatory Agency (BPH Migas), Marwansyah Lobo Balia handed over the Energy-Saving Solar Lamps (LTSHE) to the Meranti Islands Regent and Batin Suir Village Chief in Batin Suir Village, Meranti Islands Regency on Wednesday (6/2). Meranti Islands Regency is geographically located on the eastern coast of Sumatra Island which borders Singapore and Malaysia, which is included in the Indonesia-Malaysia-Singapore Economic Growth Triangle (merantikab.go.id). With this position, the Meranti Islands Regency indirectly has become the Hinterland area of ​​Batam's Free Trade Zone. However, there are still a number of villages in the Meranti Islands Regency which are still completely no accessible electricity including Batin Suir Village because they have not yet gotten the reach of PLN electricity. To reach Batin Suir Village itself, it takes 3 hours of land travel, followed by a river route by speedboat for 3 hours. On this occasion, Lobo explained that Energy-Saving Solar Lamps (LTSHE) is a breakthrough program to illuminate the people who have not yet gained access to electricity, especially in villages that are still in complete darkness, the number of which reaches more than 2,500 villages throughout Indonesia. The Energy-Saving Solar Lamps (LTSHE) package will be distributed to beneficiaries in border areas, under development areas, isolated areas and front islands or far from the reach of the National Electric Company. 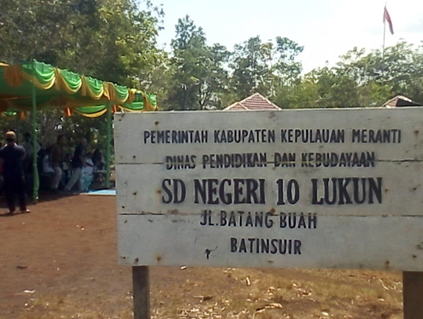 Installation of Energy-Saving Solar Lamps (LTSHE) in Meranti Islands Regency in 2018 is the proposal of the Riau Regional Government, with the location of the installation of Energy-Saving Solar Lamps (LTSHE) in Tanjung Peranap Village, Tebing Tinggi Barat Subdistrict; and Mengkikip Village and Batin Siur Village, Tebing Tinggi Timur District. "The provision and installation of Energy-Saving Solar Lamps (LTSHE) is one of the programs that directly benefits the community using the State Budget which is carried out with a joint commitment between the Ministry of Energy and Mineral Resources and the Regional Government," Lobo added.